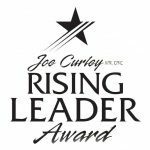 The Joe Curley Rising Leader Award is intended to identify and honor up-and-coming individual FPRA members that demonstrate emerging leadership traits along with dedicated active involvement in FPRA Chapter activities, programs, functions and events. The goal of the award is to help recognize personal dedication and engagement of members with two to five years of membership, and to help build a healthy leadership stream at the local chapter level. The chosen honoree for the Joe Curley Rising Leader Award is selected from the Rising Leader Class of that year. Membership into the Rising Leader Class is determined by chapter nomination, one candidate per chapter. The honoree receives a $500 cash reward and a $1,000 FPRA state credit that the winner can use at his or her discretion for professional development seminars, workshops or Annual Conference. All finalists for the award also receive a $150 state professional development credit. Nominee has been a FPRA member, in good standing, for two to five years. Nominee is an up-and-coming member demonstrating leadership traits. Nominee shows dedicated active involvement in their Chapter’s activities, programs, functions and events. To apply to receive your chapter’s nomination, click here. Deadline to submit for your chapter’s nomination is March 31. Deadline for chapter board’s to submit their Rising Leader Class representative is April 30. Margarita Alfaro, NuJak Companies, Inc.
Andrea Siracusa, Dreams Come True of Jacksonville, Inc.
Nanci Schwartz, The CommConnection, Inc.